02.02.2011 » Cristiano Ronaldo is a "statistical animal". Cristiano Ronaldo stats since he joined Real Madrid are truly remarkable. There were some concerns on how CR7 would adapt to a different league, after having played in Manchester United for so many years, but his numbers and statistics over the last year and a half say otherwise. Without starting comparisons with other players, we'll just point a few interesting stats that Cristiano Ronaldo achieved this season. This has been the best season so far for CR7, in what concerns the goalscoring mark. The portuguese player keeps breaking record after record and Real Madrid is undeniably dependent on him. In the last 3 matches, Ronaldo didn't score any goal and a consequence of it, was that Real Madrid found a lot of problems to turn games in their favor and get confortable wins. We'll start by pointing some of his stats this season. Cristiano Ronaldo already scored 33 goals. From those, 23 were scored in the Spanish League, according to newspaper "Marca", who considers the goal against Real Sociedad to belong to Ronaldo. Since Marca will award the "Pichichi" trophy in the end of the season, we'll stick with their numbers, even though some might disagree and subtract that mentioned goal. 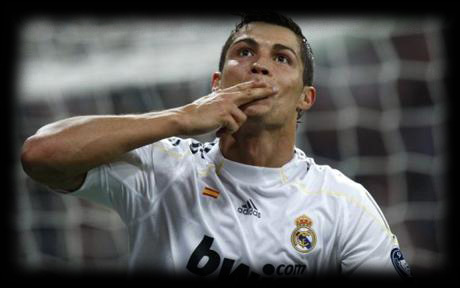 CR7 also scored 6 goals in Copa del Rey and 4 in the UEFA Champions League. All summed up, 33 goals for Real Madrid throughout this season, in 33 matches played. This season, Cristiano Ronaldo scored most of his goals with his right foot (25). However, he still blasted 6 goals with the left foot and 2 with his head. From the 33 goals, there were 6 penalty kicks and 3 freekicks. An interesting statistic shows up, when we look at the number of Cristiano Ronaldo shots on goal, which is 226. That makes an average of 14,6% scoring chances, everytime CR7 doesn't miss the target. It's been almost a year and a half since Cristiano Ronaldo joined Real Madrid. The portuguese played in 68 official matches, scored 66 goals, assisted his teammates for goal for 15 times and already signed 7 hattricks. Cristiano Ronaldo is one of those players who seems to be destined to get into the very restricted Hall of Fame list, among with the greatest players of all time that this sport has ever seen. Don't forget that Cristiano Ronaldo and Real Madrid will play tonight and you can follow the game through live streams, here on ronaldo7.net.